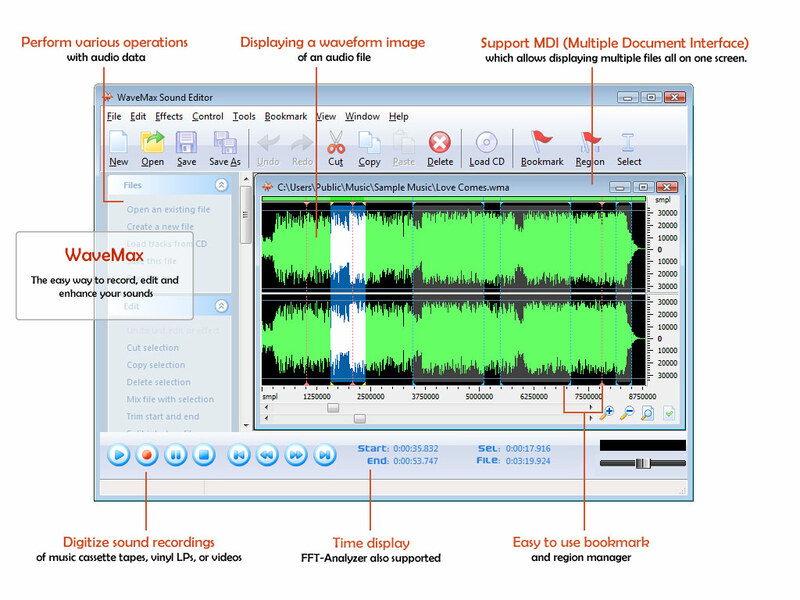 WaveMax Sound Editor 3 is an ideal solution for audio editing and mastering. The program contains everything you need to create great sounding recordings and audio CDs, including professional tools for recording, analysis and editing. The WaveMax user interface was designed with speed, accuracy and ease of use in mind. Recordings distorted by noise, clicks, crackle, clipping or missing high frequency content can be restored. ...... reverb, chorus and flanger, as well time stretching and key transposition tools. Recordings distorted by noise, clicks, crackle, clipping or missing high frequency content can be restored. Qweas is providing links to WaveMax Sound Editor 3.25 as a courtesy, and makes no representations regarding WaveMax Sound Editor or any other applications or any information related thereto. Any questions, complaints or claims regarding this application WaveMax Sound Editor 3.25 must be directed to the appropriate software vendor. You may click the publisher link of WaveMax Sound Editor on the top of this page to get more details about the vendor.